Removals to Spain is a part of the moving process that’s often shied away from. Whether it’s because it’s perceived as a stressful task or because many potential expats simply have no idea where to begin, the removal process is often the last thing movers consider. In reality, it should be at the top of the list of priorities because after all, what’s a home without any belongings? If it’s your first ever experience of moving abroad, then it’s time to get clued up on how you can get your possessions from A to B with as little hassle as possible. What Does Spain Removals Mean And What Does It Entail? First things first – what do phrases such as “Spain removals”, “transportation removal services” and “removals to Spain” actually mean? In layman’s terms, it simply means the process whereby a hired company drives to your door, picks up your belongings, and transports them from one country to another, to your new home. But this brief explanation hides the planning and precision that goes into the process. This door-to-door service is something akin to a military operation! It ensures that your precious belongings are transported overseas with the greatest of care, to arrive on time and in the condition you left them, to help you set up your new home without stress or fuss. It begins with a hired team physically wrapping all of your heavy-duty furniture such as beds and armchairs with specialised coverings that protect the items from any kind of damage. The load is taken to a secure depot in the United Kingdom, ready to be driven by an expert driver to the ferry that goes from the UK to Spain. At the terminal on the other end, your belongings are safely transported to your new house, villa or apartment and unloaded. It’s as easy as that with removal companies UK to Spain! Thousands of British people move to neighbouring European countries each year in search of a better life in a better climate. Spain is often seen as a prime location due to the lower cost of living and the cheap housing market. If you’re one of the lucky Brits who’s snapped up a property over there, then you’re going to need a stellar company specialising in removals to Spain to get your valuable furniture and items there in one piece without as much as a scratch. But how does one even begin to find a reputable, well-priced removal service? The first option is by word of mouth. When you’re next in Spain, try asking other British expats which company they used for removals to Spain from UK and if they have any recommendations they’d be willing to share. The second option (and perhaps the most informative way of doing things) is to peruse the internet. This way, you’ll see a whole range of companies to pick from. Typically, you should look for companies that have years of experience specifically in UK to Spain removals and a wealth of reviews from previous, satisfied customers. Also source a company that offers fast transportation, a reliable quote and purchasable box kits so that you can pack your smaller items by yourself. 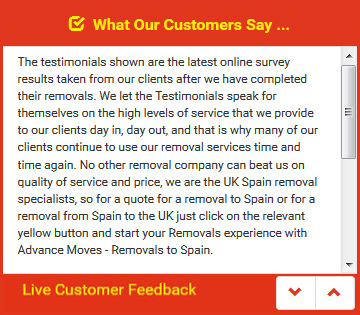 …And If You Require Removals From Spain To UK? It’s not uncommon for people to require a removals Spain to UK service, as some British couples and families are posted overseas for work purposes, for instance, and then return home at the end of a fixed period. Much like it is for Brits who want to move over to Spain, the process of trying to find a removal company is often perceived as stressful and difficult. But it doesn’t have to necessarily be as troublesome as it sounds. Luckily, there are many removal companies that operate from locations in Spain but are based in the UK. This is an advantage because it enables you to arrange removals from Spain to UK over the phone without the implications of a language barrier; yet you can also converse with someone face to face if necessary. There will be no misunderstandings when it comes to being quoted a price on the removal itself, and there is greater accountability and transparency, as you can source a moving firm that adheres to British standards of professionalism. One such indicator could be membership of the British Association of Removers. Look for such indicators of quality when sourcing a removals company and you’ll get a service you can have confidence in. Some people are tempted to save the money they would otherwise spend on their home move by tackling the job themselves. However, this is a false economy. There are numerous reasons as to why transporting your possessions to your new home by yourself is generally a bad idea, especially for first timers who haven’t rented one way van hire to Spain before. It can often turn out to be a very expensive and arduous endeavour. Many blindly self-hire a van because they think the van hire Spain process is as simple as lugging their furniture into a van, driving to a ferry to Spain, and then onto their new apartment. But there are numerous pitfalls that can occur during the trip. For starters, there’s the safe packaging of your belongings, which can be time-consuming and tricky to achieve to a high standard if you have not done it before. Then, there is the heavy lifting into the back of the van, which many people cannot physically do. There are also complexities such as sufficient contents insurance, van insurance, petrol fees and toll charges to be paid along the way. By far the best option is to work with a premier removal service like Advance Moves. After all, moving furniture to Spain is our job! Advance Moves was established in 2002, and in all the years we’ve been transporting goods from country to country, we’ve helped hundreds of people take the first few steps in their new life abroad, hassle-free. If you’re planning a move to Spain, we can help your furniture get there in one piece, safely and securely, with our quality removals to Spain service. To work with us, simply contact us via our website at http://www.advancemoves.com/. Alternatively, if you’d prefer to call us directly, then we’re available on our British number 0871 218 0612; or if you’re currently in Spain, call us on 0034 968 654 667.